The Federal Trade Commission (FTC) today announced its second major enforcement action against a wireless cramming scheme – a $1.2 million settlement with Jesta Digital, a.k.a. Jamster. While enforcement actions may give some scammers pause, the dozens of FTC enforcement actions against landline cramming scammers since the early 2000’s show that enforcement alone isn’t the answer. As the FTC itself has stated, wireless cramming is a “significant consumer problem,” demanding action by federal regulators. We couldn’t agree more. Based on data reported by the California Public Utilities Commission, the Federal Communications Commission (FCC) and the Vermont Attorney General’s office, we estimated that wireless cramming fraud is costing consumers as a much as $887 million per year. As we have said before, the Jamster case as well as Wise Media and JAWA before it, are likely just the tip of a very large iceberg when it comes to wireless cramming. Unfortunately, the wireless industry seems determined to defend its assertion that there is not a significant wireless cramming problem in the U.S. For example, in June, CTIA, the wireless industry’s association, published an industry-funded study the called into question the results of an earlier study by the Center for Rural Studies at the University of Vermont. The Vermont study found that 60% of third-party charges on consumers’ wireless phone bills were unauthorized. An earlier analysis by the Illinois Consumer Utility Board found that 44% of third-party charges were unauthorized. School is out, graduations are over, and the time for your summer vacation has arrived! You have your sunscreen, your giant cooler, and the beach chairs – all you need is that dream destination. Whether you are embarking on a last-minute getaway with friends or a family vacation planned months in advance, keeping your mobile devices safe and secure in unfamiliar places can be a challenge. Join us this Thursday, July 18 for a Twitterchat to discuss how to keep yourself safe online when traveling. There are many tricks that criminals use to defraud vacationers via their mobile devices. How do you know if your Wi-Fi network is secure? What do you do if you lose your phone away from home? Should you change your privacy settings when traveling? As consumers, it is very important to know your rights and take extra precautions while traveling. Be extra wary of any prizes and sweepstakes telling you that you’ve won a trip to the Bahamas, Florida, or any other dream location. These scams will ask you to pay a fee up front before you can receive your prize. Anyone who pays the fee will unfortunately find out the trip doesn’t exist and they have fallen victim to a scam. On Thursday, NCL will be a guest expert in a Twitterchat organized by the National Cyber Security Alliance’s (NCSA) global cyber security campaign Stop. Think. Connect. Among the topics covered will be how to spot travel scams, how to identify reliable Wi-Fi connections, safe online banking, and which apps can be helpful to protect you when you are on the road. Ask questions in advance using the hashtag #ChatSTC, and the panel of experts will answer. Or, follow the conversation live at #ChatSTC. Who: National Consumers League (@ncl_tweets), STOP. THINK. CONNECT. (@STOPTHNKCONNECT), the U.S. Department of Homeland Security (@cyber), McAfee (@McAfeeConsumer), the FCC (@FCC). As part of the Safe Browsing program, Google scans a fraction of sites in each country and utilizes the data to indicate the prevalence of sites hosting malware. A country-by-country breakdown of the prevalence of malware-infected sites shows, for instance, that approximately 2 percent of the over 14 million sites in the United States contain malware or phishing scams. By comparison, roughly 15 percent of sites in India tested positive for malware, one of the highest rates in the world. Google’s worldwide tracker identifies as many as 90,000 unsafe Web sites per week, notifying webmasters each time fraudulent code is discovered. In addition to delivering a warning page to browser users who attempt to access these infected sites, webmasters receive a report notifying them of the corruption and instructing them to fix the problem. 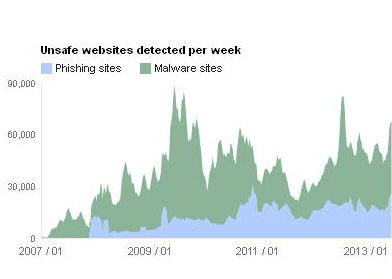 Indeed, while Google’s collection of malware and phishing data over the past half-decade has provided greater certainty of where malicious online activity persists, just what the vanguards of online security should do with the data is less certain. As privacy blogger John Hawes notes on the blog Naked Security, webmasters can now monitor the Safe Browsing site for data about their site provider service. If Google’s data show that a particular site provider comes up as a host for a number of infected sites, then webmasters will know that they should start asking questions, Hawes suggests. Moreover, webmasters can better inform themselves about which site providers have a clean record, and flag those providers who host numerous infected sites. Wireless cramming is at the top of the Federal Trade Commission’s agenda today, as government officials, advocates and industry representatives gather to discuss the issue and potential solutions at the FTC’s Mobile Cramming Roundtable. I am honored to present at the event, along with a number of other experts on the topic. For those loyal readers unable to watch the live webcast, I can sum up my comments thusly: Wireless cramming is a big problem and is only going to get worse without action by regulators to protect consumers. Cramming fraud has been around for decades. Beginning in the late 1990s, enterprising scam artists learned that they could get small charges placed on consumers’ landline phone bills. With doctored “authentications” and poor policing by the phone companies and billing aggregators, scammers made millions of dollars. As consumers increasingly adopted wireless phones, the scam artists moved to those bills. Wireless cramming is proving to be just a lucrative for the fraudsters. In its first enforcement action against alleged wireless cramming outfit Wise Media, the FTC stated that the company made millions of dollars in less than two years of operation. Wise Media is likely just the tip of a very large iceberg. While there is precious little data about the scope of the wireless third-party billing market generally and the cost of wireless cramming on consumers, we can make some educated estimates based on the data that is available.